Awa’s unique pool with a dark mosaic floor keeps the water extra cool and makes for a beautiful focal point – besides the Grace Bay waters, of course. There are plenty of lounging options like the beachside hammocks, luxurious couch, and armchairs. It’s all a part of the villa’s ultra contemporary design and style, which also includes the volcanic rock pond, an in-ground hot tub, marble fixtures, and outdoor rain showers, to name a few. Ultra Luxury Grace Bay Beachfront villa! Awa Villa blends contemporary, European luxury with beachfront property and ocean views. 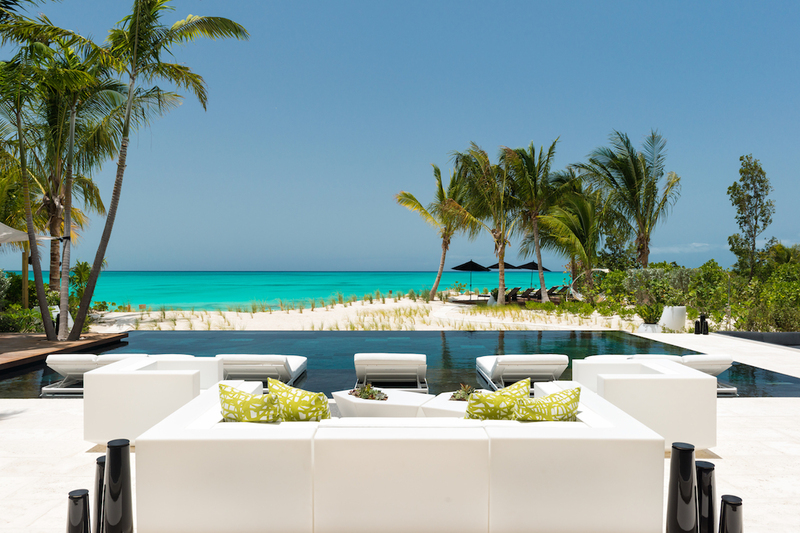 It has an enviable location on Grace Bay and is fully staffed with a private chef, butler, pool and beach attendant, housekeeper, and daily concierge. There’s endless ways to enjoy Grace Bay’s natural beauty at Awa. The villa is right on the beach and there’s a deck on the sand for sunbathing and watching the waves. Spend time in the clear, turquoise waters using the villa’s masks, snorkels, and fins. Spend time on the water in the villa’s kayaks and paddle boards. There’s also an option to rent a boat with a captain if guests want to explore the coastline. At the villa, there’s a spacious deck with a sunken lounge, charcoal-tiled pool, and a cozy hot tub. Palm trees shade the hammock, and there’s bicycles onsite so guests can ride around Grace Bay as they please. The veranda has an outdoor kitchen, a couple dining tables, ceiling fans, and a flatscreen TV. The villa also has pool floats for weaker swimmers. An alarm system provides security, and a music system runs throughout the exterior and interior. The deck leads up to the living room, which opens to the pool on one side and the garden on the other. The interiors are effortlessly elegant, with native stonework and locally milled woodwork. Custom ceramics, marble elements, and unique wallpaper brings a softness to the strikingly modern design. A volcanic rock entrance pond on one side of the main living space balances the knife-edged pool on the other. The dining table is long and sleek, and sits under a unique light fixture. The media room has a massive flatscreen TV, entertainment system, oversized sectional, marble dining table, and a secluded location around the corner from the central living area. The gourmet kitchen is fully equipped with stainless steel appliances, expansive countertops, and tons of storage. Two bedrooms sit on the opposite side of the living area, both with ensuite bathrooms and shared access to the office. One bedroom has a king bed, ocean and pool view, a flatscreen TV, and a walk-in closet. The other has a double bed, toys, books, and a flatscreen TV. Upstairs, a long corridor connects three ensuite bedrooms. Each bedroom has two queen beds, a lounge, and a private balcony overlooking the pool and sea. Their design is unique because they’re entered through the bathroom rather than directly through the suite. The master suite sits opposite, with an oversized bathroom, walk-in closet, and a large bedroom that opens to a private balcony. It also has an outdoor shower. Awa Villa is located in the high-end Leeward community on Grace Bay Beach, which is often voted the number one beach in the Caribbean. Leeward has tons of boat rentals and ocean adventures to check out, and Grace Bay has several restaurants and bars. Car rental, server, grocery and beverage shopping (pre-arrival and during your stay), liquor and wine delivery, nanny service, baby equipment, spa services, yoga and personal training, photography, and private airport transfer/car service can be arranged for an additional fee.